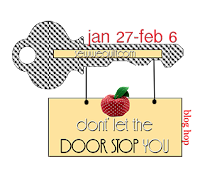 It's finally my day in the DON'T LET THE DOOR STOP YOU BLOG HOP! I've been anxiously waiting for this. I really wanted to participate in the SHE WHO SEWS blog hop, but missed out on the sign up. Booo hooo! I had soooo many ideas. But never fear, there's another blog hop to funnel my creative juices to and that wasn't going to STOP me! My first DOOR STOP light bulb moment came to a sudden STOP when I couldn't find the right supplies. My thought was to take a hexagon shaped stepping stone, cover it with a hexi grandmother's flower garden quilt block and ta da... a DOOR STOP. Now I know I've seen those hexi stepping stones before but none were to be found in my area of Texas. and covered this landscaping rock. The gail force winds of Texas won't blow this door open with this door stop. What was I thinking, putting a handle on this. Well, I was thinking I could pick it up by the handle and move it out of the way or do another door. YEAH RIGHT! Did you see the condition of that cutter quilt. It's seen it's better days and when I tried to pick this boat anchor DOOR STOP up, I start hearing rip. STOP, just pick it up with both hands and forget the handle! I had to laugh at my optimism though. A crown, every QUEEN needs a CROWN! And not just any crown will do. I have several of those and they were great inspiration. I started by drawing a pattern, added some sparkly white fabric, a round tin, a bag of pea gravel, a couple of yards of sequins, and sequins trim, and some jewels. I shared my idea with my loyal King, and he wasn't nearly as excited or impressed as I was. But not to be discouraged! I trudged on... And TA! DAH! I BRING YOU A CROWN FIT FOR A QUEEN'S DOOR! Won't it look absolutely marvelous in my studio! And by the way, I won the King's approval with the finished royal product. Be sure to check out the other DOOR STOPS participating in this hop. They're sure to STOP you in your tracks! You can see the entire schedule here. And last, but certainly not least, our fearless leader Madame Samm at Sew We Quilt and our awesome cheerleader Carla at Creatin' in the Sticks! You girls ROCK! Now, don't STOP yet, leave me a comment, join my site and/or follow me, and/or, like my page on FB, all (or just one) for a chance to win this cool panel of Handmaids to make some of the SEW adorable projects you've seen on the SHE WHO SEWS Blog Hop going on in conjunction with this one. How smart as that Carla; two blog hops in one! Have a ROYAL quilting kind of day! Doris! I love love your Crown! That was a great idea and perfectly suited to your blog!. I also love the upcycled quilt. Great job of repurposing! LOVE IT! Thanks for sharing! And I would love to win the Handmaids panel! Thanks for the chance. I am a happy follower. Love your crown door stopper, very royal! Marcella did a fabulous job on her Quilting Queen, you are sew lucky to have her for a friend. Thank you for sharing. Your door stoppers are wonderful. The painting your friend did for Queenie is fabulous! Of course a quilting queen needs a crown door stop in her studio. It is a wonderful crown. I almost hate to see such beauty on the floor. Your quilt door stop is a great idea. Thank you for sharing your Door Stop Queenie. She is simply gorgeous and really has a personality all her own. Thanks for hopping and showing lots of inspiration. Your post was very entertaining and fun! You are queen for a day, for sure. The pin cushion on steroids is terrific - you have a marvelous friend. I love your crown for your sewing room, too. Every rock needs a "pick me up" whether it's a covering or a handle. The rock is beautiful, now. Thanks for participating and being a great inspiration. Thanks for the giveaway, too. What pretty projects your have. I truly like Marcella. She is so sweet. Than.nk you for sharing. ha! they are great - love what your friend - she is sure talented. You have made beautiful projects to share. Seus trabalhos são bem diferentes. Gostei da rainha. Que perfeição! Very good ideas all. I think you now have 3 wonderful door stops to use. Your projects are all fun and wonderfully made! Wonderful ideas. Love the quilting queen stop and a perfect ides gor repurposing the worn quilt. Wow great ideas! All of them. The queen sure is spectacular and the crown is very clever. Also love your use of an old quilt. Just wonderful! Wonderful work on these pieces!! I love the crown though. Your royalty for sure ! The cutter quilt idea was a fabulous one and the saucy queen that Marcella (our precious, sweet, wonderful, giving, zealous friend ) made, is just to over the top adorable. I'm glad you still showed it ! But alas...the crown is fit for a Queen.....that would be YOU ! Great idea and beautiful execution Doris ! Those are great doorstops. I love the crown! Very cute doorstops!! Like your idea about covering the stone too! Very clever! : ) I've been following you on Bloglovin! Oh, my, your Queenie is adorable! I love the crown, too. The first is a great idea. Perhaps the quilt could be reinforced with a canvas fabric that could bear the weight! I love the idea of the handle! Your lightbulbs going off made you very busy and so creative! I love the use of that old quilt and the crown is totally fitting for you! Lucky you to have a friend make that amazing doorstop...she's beautiful! I like the idea of your doorstop suiting your royal theme. It is a very pretty crown, too! Doris, your crown is just gorgeous--perfect for a quilting queen. And your friends creation is really lovely. I also like the idea of using old quilts for new things and your use of it for the doorstop was great. Old quilts are kinda delicate though. Thank you for sharing today. I love your queen and your crown! Great door stop. Your crown reminds us all the we deserve to be Queen for a day, at least in our own sewing rooms. Your story just made me laugh, putting a handle on an old quilt and a brick!! That's some sassy queen! Love the red! Your queen is great and the crown is perfect. Great idea for a cutter quilt. Sew cute. The queen is adorable! So many ideas, and each one of them are so creative!! I love each and every one of your doorstops. I especially love the sparkly crown, very fancy. ;) Nice work! Wow! You are such a creative lady! I love all of your projects...and enjoyed the info about Marcella. I had no idea! Keep up the great work and I hope I win the panel...I love the fabric line! Tombstone + old quilt = Great Door Stop!!!!! Love the queen too! Everyone is "sew" creative! I think that your door stop is very clever. Covering it with an old cutter quilt is perfect, and your Queen & her crown are delightfully sweet. Well done. Very clever all of them but I love Queenie the best and her face is so gorgeous. Thanks for sharing with us. Great doorstoppers. To add a handle to the first one make a handle, sew it into a circle and wrap it around the bottom and sides. Of course you'd have to hand or machine sew it to the quilt. Thank you for this project. I love that crown. I love Queenie and the crown! 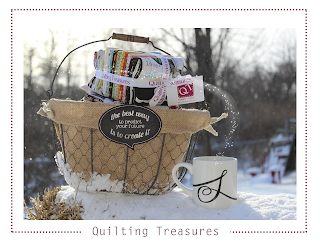 Just what a Quilting Queen needs! Wow. You certainly ended up with a few door stops. I love them. The are all adorable! I do love that crown, and if it's good enough for the King. . . .
What a great use for an old quilt. Your fun little queen that your friend made is over the top. I can't imagine using her for a doorstop. The crown is quite adorable. All of them are just so fun! I, too, laughed when I saw your first doorstop - those hunks of concrete are mucho heavy. Queenie was outstanding and I can see Marcella's talent and her "Jim Stone" techniques in the face. Love your crown - The Quilting Queen needs her own crown doorstop, for sure! I have watched a lot of articles regarding information for Truck onleveling kits, Suspension and other parts of a Truck for customization. I found similar website which has similar information and also a lot of lift kits and other information. The information of http://prestigecustomrides.com/is really attractive rather than I found from local market. ARE YOU READY TO RUFFLES? A VACATION FIT FOR A QUEEN??! !